This last weekend, I had the great pleasure of attending the 4th ALS Friedman conference in Sydney. It's was a pretty standard libertarian conference on a rather large scale (350-ish people) with really high-profile speakers, great discussions, meeting cool people, and chatting over dinner and in bars. Lots of fun, very intellectual and of course a shortage of sleep. This particular conference with its focus on "wide-tent libertarianism" and "activism" was however sometimes getting rather absurd, where liberal party members are suddenly 'libertarians', ministers were all around and many displayed a very uncanny respect for politicians ("I acknowledge my fellow politicians in the room.."). The main attraction, hands-down the best and most touching speak was by Yeonmi Park, the North Korean defector who escaped from the misery of totalitarian socialism back in 2007, at the age of thirteen. She told us her absolutely heart-wrenching story of growing up in the northern parts of North Korea, facing incredible hardships and famines and dangers I can scarcely imagine, as well as the even more dangerous escape across the river into China - where North Koreans are lawless and heavily abused. She told us unimaginable horrors, watching her mother being raped in front of her upon arriving in China, being sold into slavery, tricked, abused and separated from her mother. If illegal North Koreans are found in China, they are sent back, facing severe punishment or even execution - which many unscrupulous Chinese know, and use to threaten them into doing literally whatever. She tells her story in even more detail in her recent book, In Order To Live, which I couldn't wait to get my hands on, and went through it day and night. It's a story of tears and misery and suffering - but also of overcoming hardship, never losing hope and growing up way-to-quickly. I wanna share a couple of quotes from her book, but first a few observations from her speech. 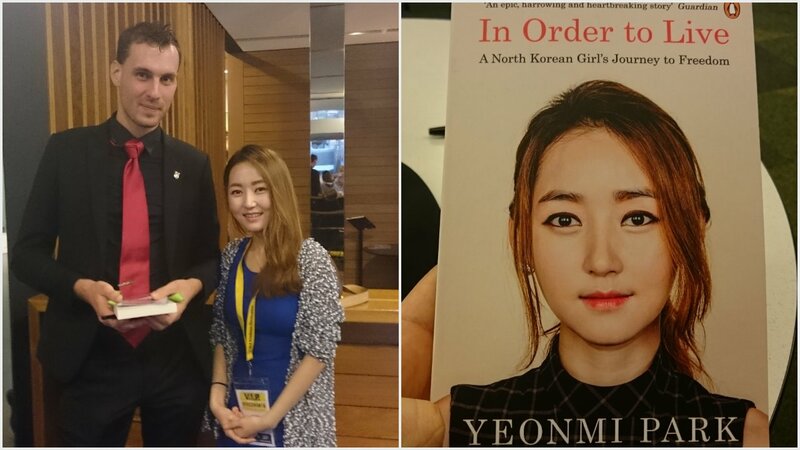 This super-tiny, humble North Korean girl has been through more suffering than I can even comprehend. Yet she mixes her story with humour: of how she couldn't understand why anyone made a movie of such a shameful event as Titanic, of her first confused experience with a South Korean toilet, that 'love' for people rather than the Dear Leader was an unknown concept to her, that math classes in her childhood were "if I kill two American Bastards, and you kill three American Bastards, how many American Bastards are dead?". And when audience greets her with standing ovations that go on and on, most of us with tears in our eyes, she gets really uncomfortable, bows humbly and waves us all down. The amount of self-knowledge and ability to use humour to heal is remarkable, as is her dignity and humility and kindness. - "Ship them all off to North Korea!" Polemics and mockery aside, she has a point. Capitalism has done so for centuries in the west, for decades in China and India. And Scott Sumner recently joked that "reality has a neoliberal bias"; markets have, do and will set us free. In her last few chapters, Yeonmi tells us the story of reuniting with her sister Eunmi after seven years apart, of how she has gone on to be even more outspoken, giving talks and lectures all around the world - even to the point that the North Korean regime made propaganda videos about her, denouncing her as a "human rights propaganda puppet". North Korea is captivating through its sheer craziness, and as Michael Malice repeatedly has said on the Tom Woods show: everyone is a libertarian visavi North Korea (here and here). Taken together, Yeonmi's stories are incredible, inspiring, horrible and brave and they make you cry from laughter on one page and misery on another. An incredible person and I was very lucky indeed to have heard her story.